The Social Media Company’s relationship with Run/Walk For Life is one that gets our hearts racing! 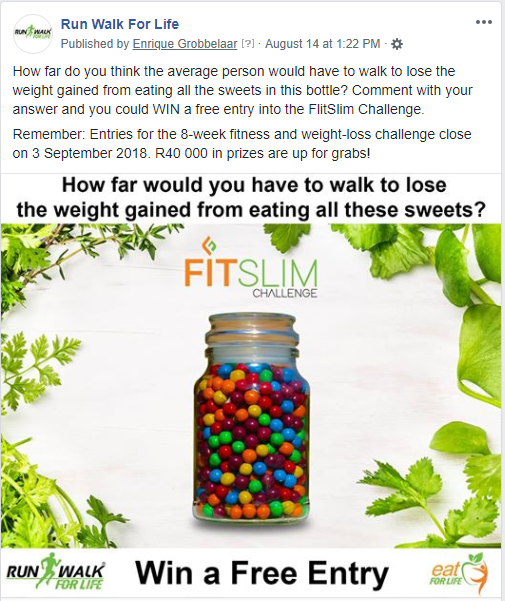 In August 2018, The Social Media Company took over the social media management of the Run/Walk For Life brand. Since taking control of their social media, we’ve managed to increase post engagement by 1 413%, and social media reach with 221%. With Run/Walk For Life, everything we do is in line with the ethos of the brand, which focuses on inclusivity and openness. Run/Walk For Life is a health and wellness programme for “real” people. 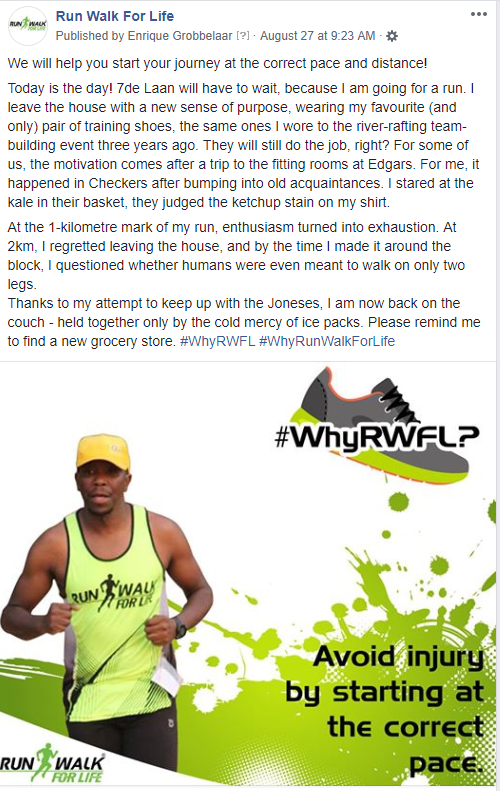 A brand like Run/Walk For Life offers its own challenges, like the fact that it as over 90 branches, all with their own social media profiles managed by franchise owners. Due to the friendly competition between the various branches and regions, we’ve encouraged them to keep up with the local branch pages. We provide support to all the managers on a daily basis, and have found various ways to encourage branch managers and members to spread the Run/Walk For Life story online. While it is generally excepted that posts with limited text does better on social media, you do occasionally manage to attract attention with the use of good copywriting. This was the case with a special campaign we ran for Run/Walk For Life focussing on the benefits of Run/Walk For Life.